The £1bn redevelopment of the St James Centre in Edinburgh has finally got under way, following years of delay. Building work began after developers TH Real Estate sold a 75% stake in the 1.7 million sq ft retail and leisure centre to Dutch pension asset manager APG. TH Real Estate will hold the remaining 25% stake. The project met with a series of delays, with developers blaming difficulties in attracting international investors in the wake of the financial crash in 2008 and "uncertainty" surrounding this year's EU referendum vote. 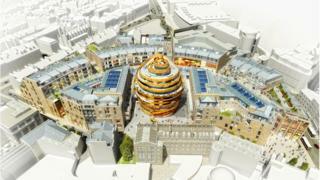 Edinburgh St James will comprise 850,000 sq ft of retail space, anchored by John Lewis. It will also feature a multi-screen cinema, a 214-room hotel and 150 private apartments. Developers said the revamp represented one of the UK's largest private sector regeneration projects and would lead to 3,000 permanent jobs. The retail and leisure aspects of the development are expected to complete in 2020, followed by the rest of the project in 2021. Demolition work is expected to start in the next few weeks and take about 18 months to finish. Economy Secretary Keith Brown said: "The Scottish government warmly welcomes this major investment in Edinburgh and Scotland, which will have significant positive impact on construction activity, jobs and the economy. "I am particularly pleased that the Scottish government has been able to help unlock the investment by working in partnership with the Scottish Futures Trust and Edinburgh City Council on the Growth Accelerator Model through which we will be contributing significant sums and assisting the council to manage risk. "This is a major signal of investor confidence in Scotland, and provides further demonstration that Scotland is open for business." Edinburgh's economy convener, Gavin Barrie, said: "The new St James will transform the east end of Edinburgh's Princes Street, providing much needed premium retail space and leisure facilities, new homes and a world class five-star hotel in the heart of the city - creating thousands of jobs in the process and adding millions to the Scottish economy each year."